Chevra Hatzoloh, commonly referred to simply as “Hatzoloh”, (translated as ‘emergency rescue’) is the largest volunteer ambulance service in the United States. It was founded in 1969 by Rabbi Hershel Weber during a time when ambulances regularly took 20 minutes or more to reach their patients. It started with a few volunteers in Williamsburg, Brooklyn who carried oxygen tanks and first aid kits. They had minimal training but maximum motivation. Flatbush Volunteers of Hatzoloh, Inc, the largest affiliate of “Hatzoloh”, with over 200 volunteers operates 24 hours a day, seven days a week throughout the communities of Flatbush, Midwood, Kensington, Marine Park, Madison, Sheepshead Bay and Brighton Beach. We respond to over 15,000 calls annually. Emergency Medical Services: Hatzoloh provides a high level of pre-hospital lifesaving treatment and transport free of charge to anyone who calls, regardless of race, religion, or ethnicity. Every one of the 200+ Flatbush Hatzoloh rescue workers, including Emergency Medical Technicians, Paramedics, Doctors, and Dispatchers is a volunteer. Hatzoloh members must complete rigorous N.Y.S. Department of Health training programs in emergency medical care, and must be re-certified by New York State every three years. Personal Care for Special Circumstances: In addition to emergency medical treatment and ambulance transport, Hatzoloh also provides additional support to patients and their families by taking a comprehensive approach to each case. If family members are suddenly thrust into the often-bewildering routines of a hospital, Hatzoloh will put them in touch with the various bikur cholim societies (who visit the sick and provide support to the families), blood banks and other related services. It is not uncommon for a Hatzoloh member to reach into his own pocket to provide for a patient’s spouse or child stranded in the hospital without purse or wallet. Hatzoloh members regularly extend themselves to relieve the patient’s anxiety by taking care of personal needs such as notification of relatives, making sure the house is locked, etc. When patients need unique or specialized care, Hatzoloh members make sure that the patient is taken or referred to the most suitable medical facility. Unfortunately, when the need arises, Hatzoloh members have even arranged funerals for patients who are without resources or relatives, and have used their resources to help avoid autopsies. Two-Tiered Response System: By operating a two-level system of trained first responders (EMT’s & Paramedics) and ambulances, Hatzoloh can provide response times that are virtually unheard of in the world of emergency medicine. Hatzoloh Central Dispatch sends First Responders to the scene of an emergency in their privately owned vehicles that have been specially outfitted with lights and sirens. Each volunteer carries a full complement of emergency medical equipment. Paramedics carry in their vehicles full advanced life support equipment, including state of the art patient monitors with 12 lead EKG cardiac pacing, intubation kits (for advanced airway management), and supplies for administration of first-line drugs. As soon as the First Responders are dispatched other members are dispatched to bring one or more of Flatbush Hatzoloh’s eight ambulances, when warranted. This combined response strategy enables Hatzoloh to provide a trained emergency care provider at the scene generally in less than two minutes. In addition, Hatzoloh’s paramedics contact emergency room physicians for medical control and provide the hospital staff with critical data to expedite the Emergency Room standby. 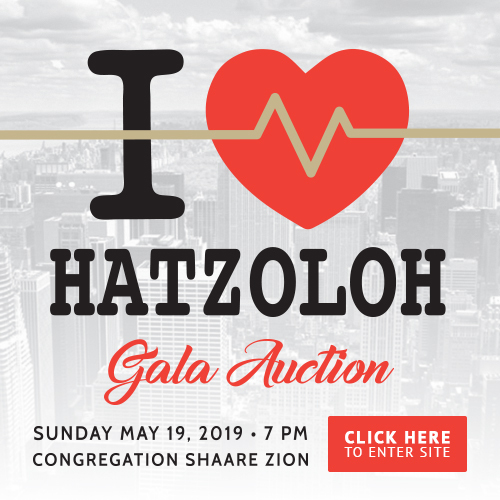 Hatzoloh volunteers drop everything and respond to emergency calls from their jobs, their homes, their Sabbath meals, Pesach Seders, children’s graduation ceremonies, and even from their much-needed sleep. Dispatch/Communications: Hatzoloh has developed its own state of the art computer-aided dispatch system which provides Hatzoloh dispatchers with vital technical assistance, including instant caller location, a computerized digital map tracking system to locate the closest units to an emergency call, online access to prior history records, and the ability to manage up to sixty calls simultaneously. The system also has the ability to provide computer prompted pre-arrival instructions to guide dispatchers in providing lifesaving instructions until help arrives at the scene. As Hatzoloh’s service area is constantly expanding, the two-way radio coverage area has been upgraded to include additional radio transmitter and receiver sites. Because of steep increases in call volume, Hatzoloh has added signaling features to its radio system and has integrated its entire radio communications with the computer aided dispatch system. To meet the additional call volume and incorporate the system upgrades, Hatzoloh has established multiple regional dispatch centers with additional emergency hotline line facilities to assure that all emergency calls continue to get through the first time, every time. Holocaust Survivor Services: Hatzoloh is uniquely trained to service the Holocaust survivor population, which has placed its trust, dependence and hope in our hands. Hatzoloh personnel, mostly children of Holocaust survivors, serve these survivors in their hour of need by providing “caring care”. Special sensitivity training, as well as common language and social interaction, enables the Hatzoloh volunteer to alleviate some of the unique anxiety and fear that many Holocaust survivors experience during an emergency crisis. Immigrant Services: Hatzoloh serves the needs of numerous immigrant communities as well as visitors from all corners of the globe. Among the volunteers, there are designated interpreters for Russian, Yiddish, Hebrew, Arabic, Bukharin, Romanian, Hungarian, Farsi, French, Polish and German. Dispatchers are able to reach these members whenever needed. Finances: Hatzoloh depends solely on private donations: individual, communal, corporate and foundation gifts. Almost all funding goes directly to rescue operations. Administrative costs are kept to a bare minimum, with a miniscule staff managing the Flatbush Hatzoloh office. Volunteers perform dispatch and response operations around the clock, free of charge. Nevertheless, costs are astronomical: Flatbush Hatzoloh operates a fleet of 8 ambulances to cover the Flatbush region. Fully equipped high risk advanced life support ambulances cost upwards of $200,000 each. It costs $35,000 to equip each and every one of Flatbush Hatzoloh’s 29 paramedics with the latest technologically advanced Cardiac/Monitor defibrillators, intubation kits and medical drug boxes. Each advanced life support call can cost hundreds of dollars in first-line drugs and medical supplies. The cost of equipping each volunteer with portable oxygen resuscitators, semi-automatic defibrillators, two-way radios and trauma kits, radio and communication apparatus, and insurance costs drive our yearly budget to 2 million dollars. Our Mission is to provide the highest quality of medical care as rapidly as possible while maintaining the utmost level of professionalism and compassion for each and every patient we encounter. Training and re-certification courses; continual in-service training. 13,500 responses in 2016 of which over 6,500 were transported to hospital. Funded solely by the Flatbush community and primarily through the Shul drives. The ONLY investment that never loses value!